IT IS MOSTLY ABOUT MOVIE AND MY STORY. ENJOY. One day, I went to the cinema with my friend to watch Warm Bodies movie. At first, I hesitated to watch that movie, because I know that the story was similar with Twilight movie which is about the romance between the myth creature and the human. So, I assumed that Warm Bodies plagiarized the Twilight movie. However, after I watched the movie. I realized that I was wrong. Warm Bodies is very different from Twilight. After I compared the story, the character and the background of the two movies, I could say that Warm Bodies is better than Twilight. The first thing I considered was the story. First of all, both movies have the same main stories that tell about the myth creature who falls in love with the human. But that is where the similarities end. Twilight only has a flat-plot. The conflict is just only one that Bella is wanted by many vampires to be their meals because she is a human. However, Warm Bodies has more conflicts that makes the audience will laugh when they watch it but it is still consistent on the romantic and thriller itself. The characters of the two movies have the most influence for me to say that one movie is better than another. The main characters of both movies are the myth creature, such as vampire, zombie and ghost and the human girl. 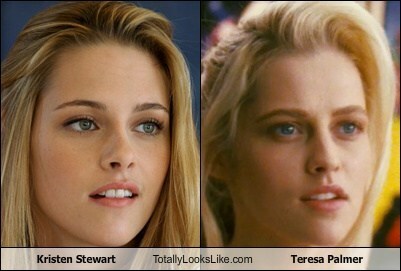 Also the actresses who play as the human girl in both movies have similar face, Kristen Stewart (Twilight) and Teresa Palmer (Warm Bodies) are often called twins because of their similar face and expression. But the human girl character is different. Teresa Palmer as Julie in Warm Bodies has a strong and brave character. She can defend herself when the danger come to her. It is really different from Kristen Stewart as Bella in Twilight. Bella cannot defend herself from the danger and she is also a weak person, because there must be Edward or Jacob who protects and saves her when the danger comes. So, I love Julie character in Warm Bodies than Bella in Twilight. Furthermore, the background of both movies are quite similar. Bot movies are based on the novels which are written by Stephanie Meyer. But, when those novels are made to be a movie, the moral message in Twilight is not really shown clearly. The audience just knows about romance between Edward and Bella. Not only that, Twilight has four sequels of movie which I think the sequels are not really good. So, the audience get bored about all the romance between Edward and Bella. In conclusion, even though they have a lot in common, they have their significant of characteristics that make them both different. After watching those movies and analyzing their differences and similarities, I can conclude that Warm Bodies wins in the story. The main-girl character and the background. So, Warm Bodies is the best romantic-thriller movie after Twilight. Very cool movie review, I also prefer Warm Bodies movie than Twilight. The story is better and richer in emotional aspect, because it combines comedy, romance, thriller, and action. Scared, thrill, and funny. Movie freak especially Marvel and Musical. Kok Nikah Gak Ngundang-Ngundang Sih? Hamil pertama gak mual? Kalian gak sendiri kok.